We were fishing on an 18 kilometer stretch of river, between the big dam in Riba Roja and the smaller one in Flix, where only four guides fish with their guests. There is no commercial fishing on this part of river, and the locals who are used to a diet of sea fish, have no interest in the freshwater species. Milos spent two months here last summer, fishing with our host Sasa Valentic, so you can’t say that we lacked some local knowledge. 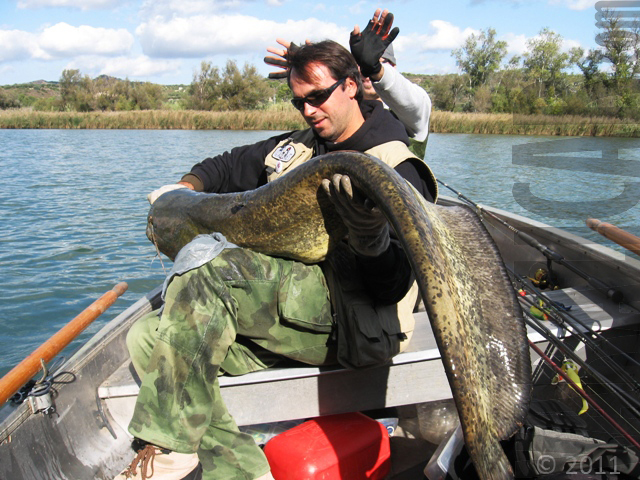 Knowledge of the local fishing spots, combined with our Danube experience, proved to be a winning combination. For the most of the day, the fish were lying at the river bottom, in underwater holes, channels, hidden behind big boulders, and were coming out to feed an hour before the sunset. 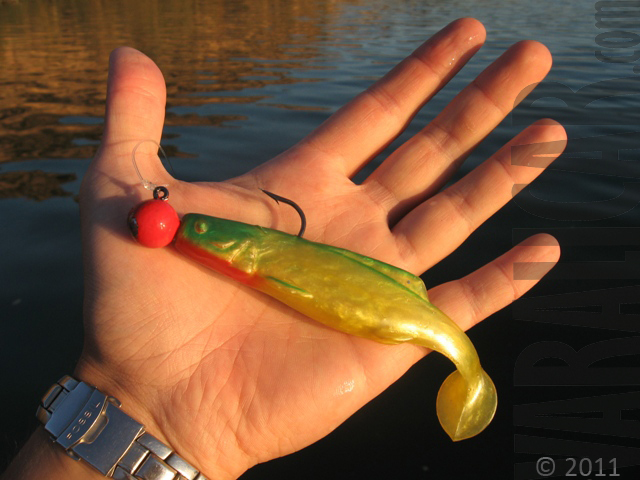 In order to avoid spending the day in a siesta of some sort, expecting that „golden hour“ of the day, we resorted to jigging soft-rubber baits that have little or no vibration at all. Slow flow of the river allowed us to explore every inch of the river bottom in great detail and in „low gear“, thus giving the big cats a longer time to react to our lures. Aldo the outside temperatures were in the range of 50 to 68 degrees, and the water was well above 60, we were still catching fish in the warmest part of the day, from 11 am up to 05 pm. First fish of our trip was caught by Milos, who landed a 7,15ft long cat, weighing in at 148lb, the very first day. During these 6 days we spent on the water, we caught a total of eight fish measuring over 4.2ft in length, with some smaller specimens in a „11-33lb class“. 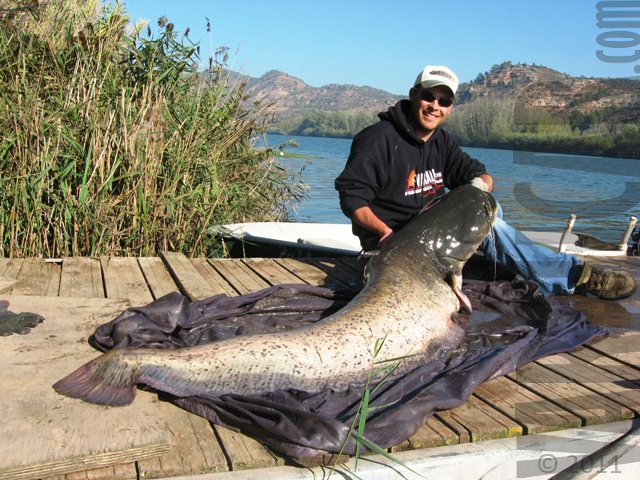 Robert improved his personal record with a 5ft long cat. The fish, weighing in at some 60+ lb, caught on a vertically jigged Smuki „fluke“, gave the fisherman 20 minutes of unforgettable fight. I managed to hook a fish as well. 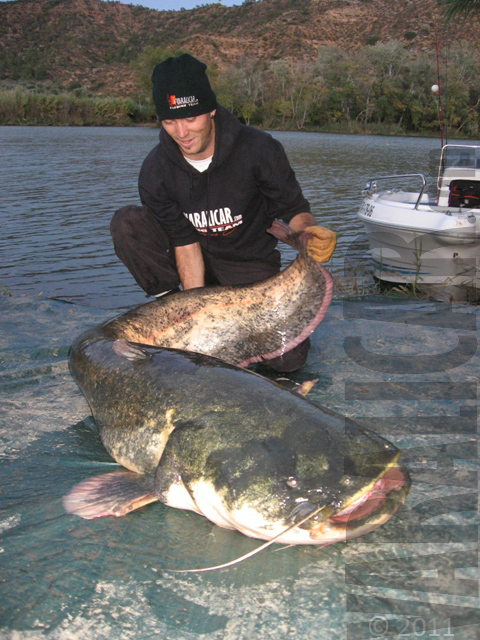 It was a 6,4ft long, 102lb wels catfish. 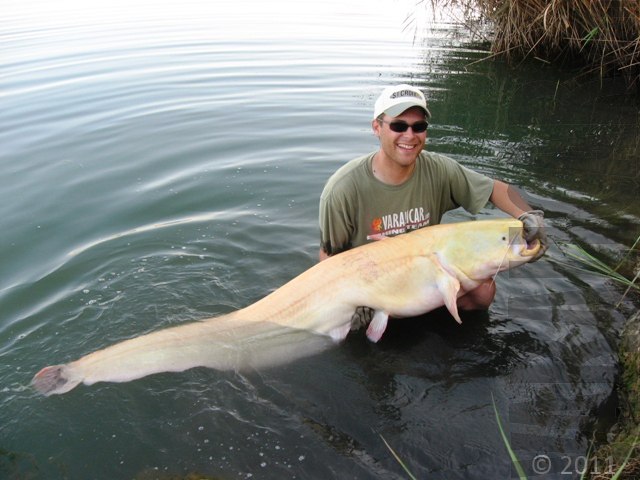 An absolute surprise came to me on the fifth day of our trip, when after 30 minutes of playing the fish, in a clear water beside the boat, I caught a glimpse of a yellow cat, later weighed at 81,5lb and measuring 5,7ft in length. 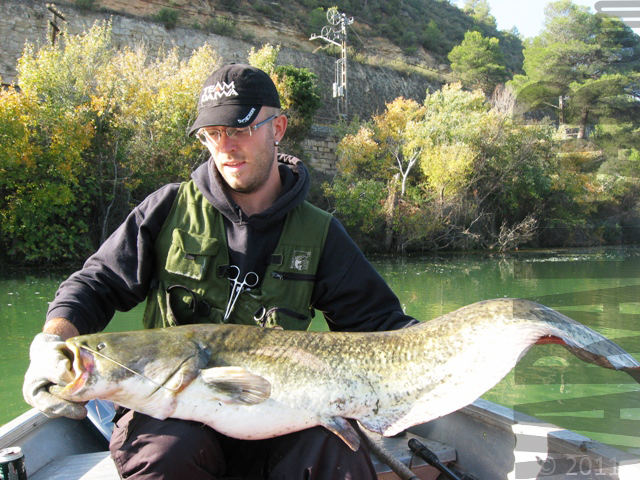 These “blonds” are not so uncommon here on Ebro. They come in many variations, with less or more black spots on a yellow base. One of these fish was caught three times this year, which goes to show that their is some sense in careful handling of the catch. For fishing from an anchored boat, we used rods of 9 to 10ft in length, with casting weights in range of 2.8 to 8,8oz paired with reliable Penn Slammer stationary reels. 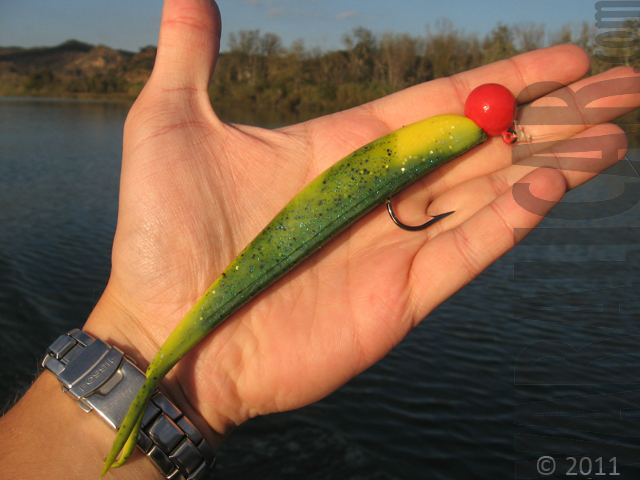 While vertical jigging we used somewhat shorter rods, of some 6 to 8,6ft in length, combined with multipliers. 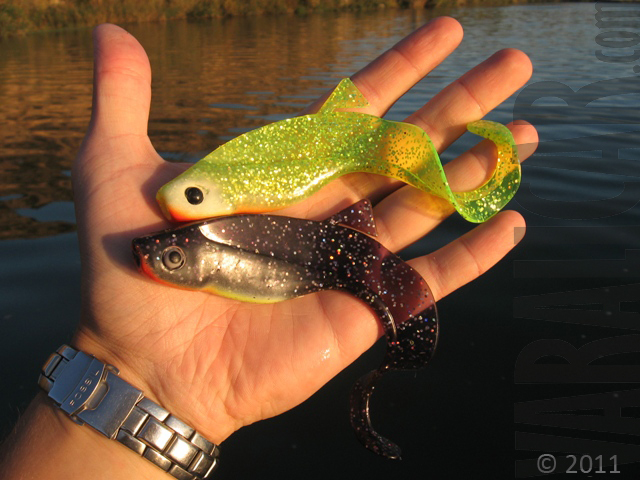 We mostly used soft rubber lures like Fin’s Fish, Smuki’s fluke and Orka’s Shad, Fenix and ShadTwister models on jig heads in range of 1 to 1.4oz. Our stay in this prestine surroundings was made complete by our host, who made sure that none of our short lunch brakes go by without a delicious meal. At the end, an advice for all future visitors of this beautyfull river – Bring enough spare clothes. 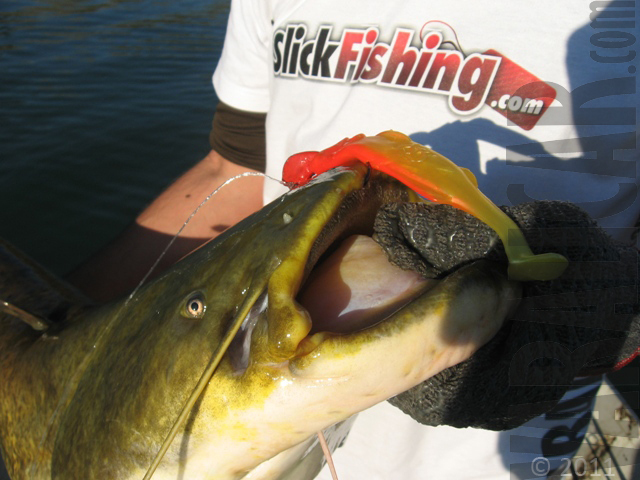 Not because of the cold climate, but because of the abundance of slimy fish. Published in “Ribolovački magazin” 118, November/December, 2011.